Today is "Crossover," the midway point of the Session where the House and Senate must complete work on their bills. Over the past week, the biggest issue we dealt with was the Electric Utility "Rate Freeze" Repeal. This bill would repeal the Utility Rate Freeze Bill of 2015, which was passed to address concerns about possible rate increases resulting from the Clean Power Plan. The bill froze Dominion and Appalachian Power's rates at their 2015 levels for five and four years respectively. Rate reviews would begin again in 2020 for Dominion and 2022 for Appalachian Power, but those reviews would not "look back" at earnings made before 2018 (Dominion) and 2017 (Appalachian Power) over the freeze period. Any resulting over-earnings after those dates would be refunded to customers. With the election of Donald Trump, the Clean Power Plan has been dismantled, and the utilities did not incur the costs they were expected to during the rate freeze period. As a result, the SCC estimates that the utilities have "over-earned" several hundred million dollars since 2015. Several bills were introduced this session to repeal the rate freeze. 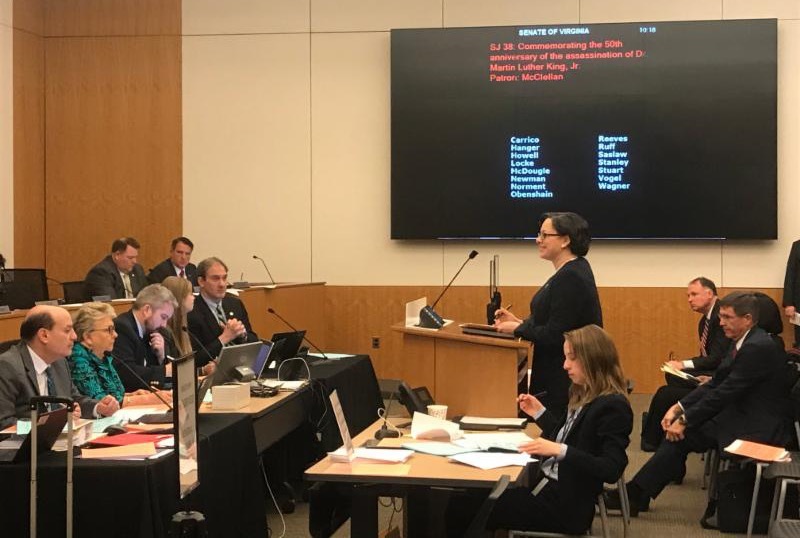 Straight repeal bills were defeated as the fight focused on how much of the over-earnings should be returned to customers and how much should be reinvested in clean energy and electric grid modernization that would benefit all Virginians. Allows the State Corporation Commission (SCC) to evaluate rates in 2021. There is much in these bills to like, particularly the transformational investments in clean and efficient energy, immediate rebates, returning rate oversight to the SCC sooner than under current law, and expanding and extending EnergyShare programs that help customers facing financial hardship another nine years. However, the bill appears to allow for "double-dipping" by the utilities in how they recover the costs of the investments outlined above. As a result, it is not yet clear whether this bill is better than the status quo. As a result, I voted no on the Senate version, which passed the Senate 26-13. The House version includes a reporting requirement to allow the SCC to determine whether or not there is double-dipping. I am hopeful a final bill will include this amendment to allow the maximum transparency possible and address concerns raised by the Virginia Poverty Law Center. In the meantime, I encourage you to share your thoughts on this legislation with me at district09@senate.virginia.gov. Sen. McClellan presents SJ 38 to the Senate Rules Committee. Here is an update on what happened with my legislation this week. As noted in previous updates, SB 287 , SB 101, SB 291 , SB 359, and SB 456 already passed the Senate and await House action. In addition, SB 329 (which incorporates my SB 455) passed the Senate. SB 290 providing local governments more flexibility in adopting affordable dwelling unit ordinances passed 26-14. The Virginia Poverty Law Center explains this bill's importance here. SJ 42 extending state recognition to the Wolf Creek Cherokee Tribe of Virginia reported out of the Rules Committee by voice vote. My SB 354 for a COPN for a new ambulatory surgery center in Planning District 15 for the provision of ophthalmic services to was rolled into SB 266 with several other bills and reported out of the Education & Health Committee. The bill was requested by the Virginia Coalition to Reform COPN and Dr. Suzanne Everhart, an ophthalmologist in Ashland who finds it increasingly harder to use hospital operating rooms to perform eye surgery. SB 289 was carried over with a letter to the Virginia Conflict of Interest and Ethics Advisory Council to consider making clear that business names should not be redacted from documents/forms made available to the public. This will be part of a larger study of the Conflicts of Interest laws that a joint subcommittee of legislators will review as a result of SJ 75. SB 357 requiring all death certificates to be electronically filed with the State Registrar was carried over by the Education & Health Committee to allow a working group to determine a date by which the bill can be implemented.